When Weeks Ringle and Bill Kerr of Modern Quilt Studio asked if they could feature “Nested Boxes” in an upcoming issue of Modern Quilts Illustrated, I was a bit excited to say the least! The issue, #7, is now out and it’s an odd feeling to see something you have made in a totally different setting – the beautiful styling of the photo makes me want the want the entire room – even the healthy plant! 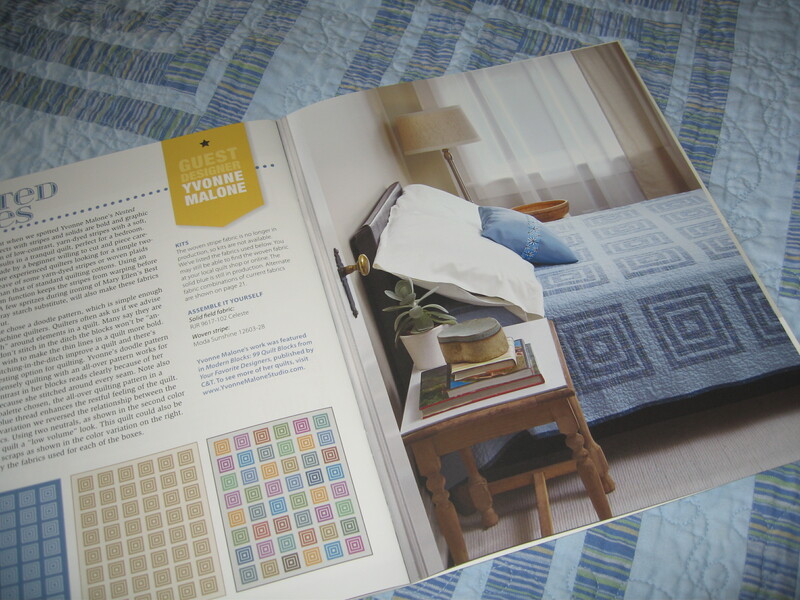 I have enjoyed making this quilt several times and have always leaned towards a low-contrast look in selecting the two fabrics – Bill and Weeks offer a couple of other looks in the magazine. While careful piecing is critical, once the colors are decided upon, it is all about the sewing and watching the quilt come together. To check out the quilts/patterns featured in Issue #7 of Modern Quilts Illustrated or to subscribe, go on over to Modern Quilt Studio here. 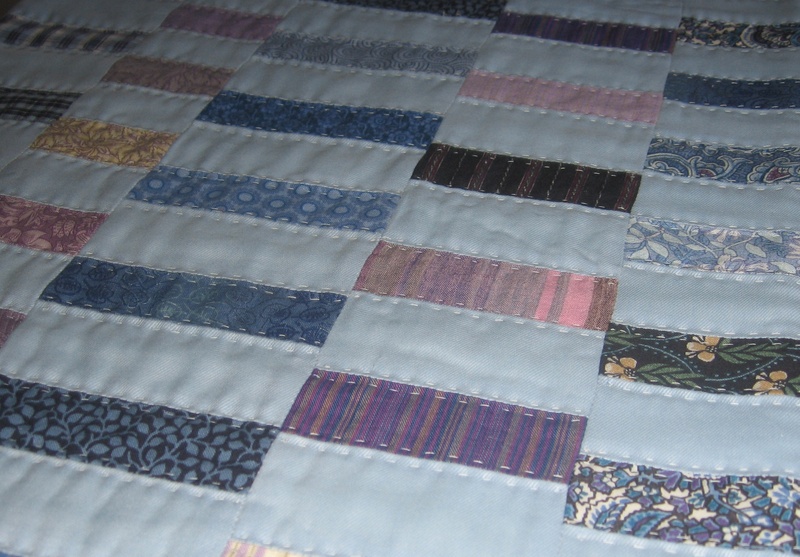 Many of my quilts begin with a big idea that is inspired by something – like a story in the newspaper, a garden in full bloom, a brick sidewalk laid in an interesting pattern, even memories of the wash hanging out on the clothesline when I was little. 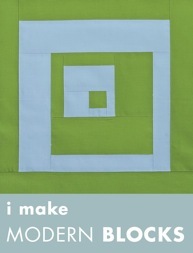 Balance, my latest quilt pattern, is no exception. When my close friend Katy completed her studies to become a certified Healing Touch practitioner, her husband commissioned a quilt to celebrate the event. After spending time researching healing touch and learning more about Chakras, I sketched out a number of ideas; Balance is the one my friend chose. While I continue to make this quilt on a commission basis, I also wanted to make the pattern available to other quilters, so here it is! 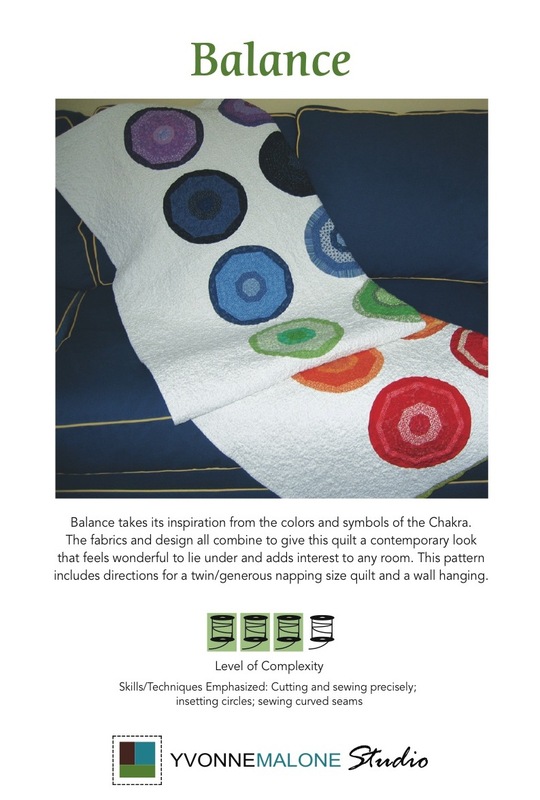 The color work in the sample pictured above and in the pattern is based on the colors of the Chakra. 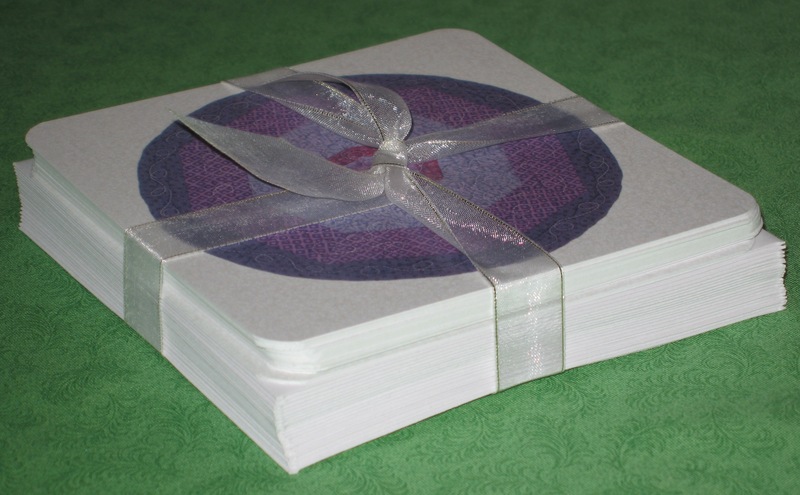 However, it would look stunning in all one color or with the circles set in a background of black. 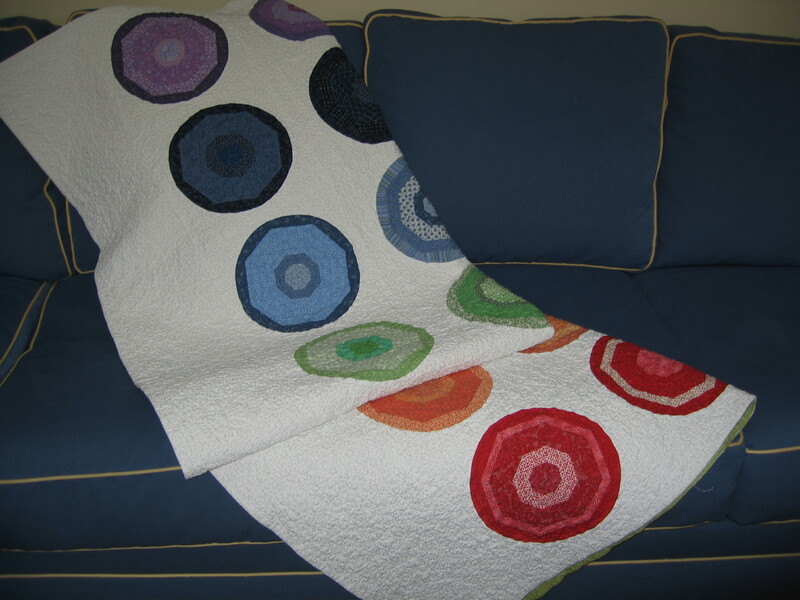 The circles are pieced from narrow strips of fabric so it is a great way to use up odds and ends in your stash (or the stashes of your quilter friends!). Detailed directions are provided for both a twin/generous napping size, as well as a wall hanging. To see more details and to order the pattern, visit YvonneMaloneStudio.bigcartel.com. Thank you to the recent Playing With Fabric reader for asking about Jazz Club, a pattern I designed as a free download for Troy Fabrics to highlight Marcia Derse’s Nouveau Chic fabric collection and first mentioned in this post. Just click on the link below to print a free copy of the pattern. Happy sewing! 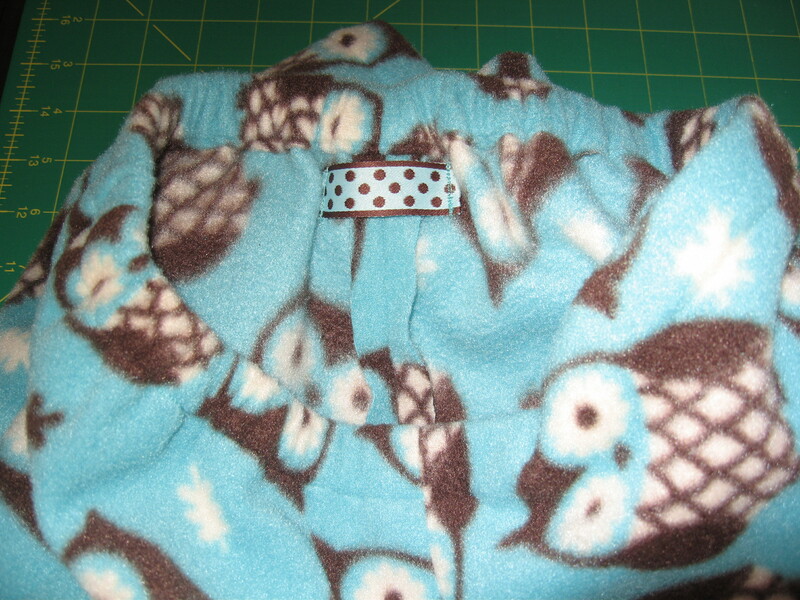 Feeling totally inspired from meeting with my quilting group on Saturday morning, today, my daughter and I set aside some time to make a new pair of fleece pajama pants. We used a pattern we had used before from Heather Ross’ book, Weekend Sewing: More Than 40 Projects and Ideas for Inspired Stitching, but added a few inches here and there to accommodate her growing frame. Altogether, we probably spent about one hour on the project. I also made a silent promise to her that in the coming weeks when life can get quite busy with shopping lists, parties, work deadlines, homework, etc., we are going to carve out some time each weekend throughout December to make something. Making the pattern a bit bigger. Pieces are cut and ready to sew. Adding a ribbon loop to hang the pants from on the door hook. Next on the list: a fleece t-shirt for Audrey, our Rhodesian Ridgeback mix. For fun, my daughter put a t-shirt onto Audrey this weekend and she actually really likes it; in fact, she seems a bit sad when it comes time to take it off! We think that she believes that if she wears clothes like ours we will soon invite her to pull up a chair to the dinner table. Stay tuned – if it turns out well, I will post the how-to here next week. Happy making with your friends and family this holiday season! Despite concerns that the fall color show might be compromised by the drought, the colors here in the Chicagoland area were magnificent this fall. The leaves seemed to cling to the trees longer than usual, but with a few rains and windy days, most trees are bare and the show is now over. 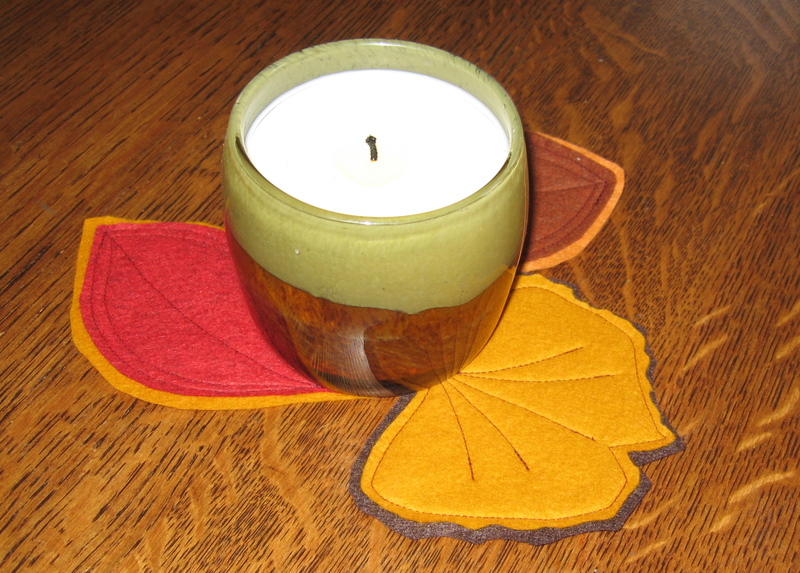 I’m not quite ready to be done with the fall colors, however, so I decided to bring the color scheme inside with leaves made out of felt scraps. Here’s how to make the leaves . . .
1. 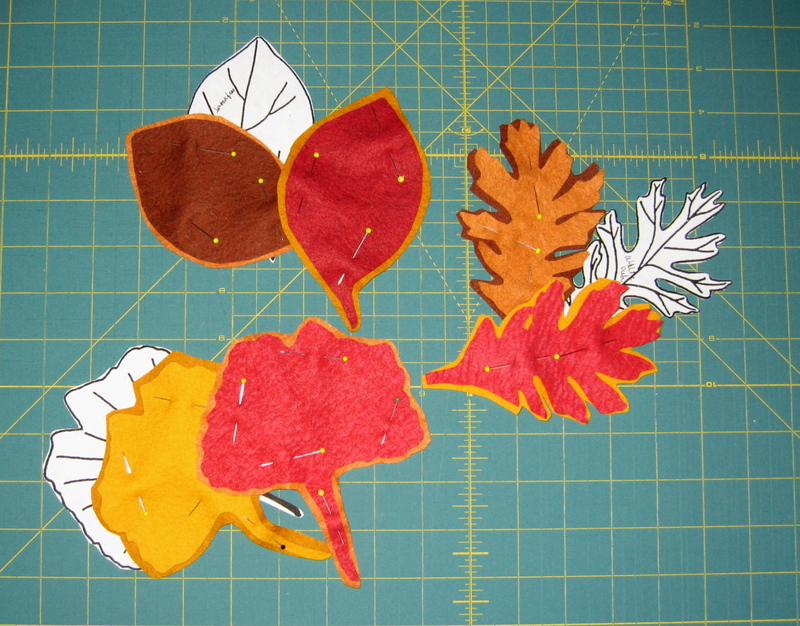 Collect felt scraps in fall colors – oranges, reds, browns, yellows, greens. 2. Download leaf coloring pages from the Internet. If you are feeling a bit too constrained by these, design your own leaf shapes from trees real or imagined. 3. 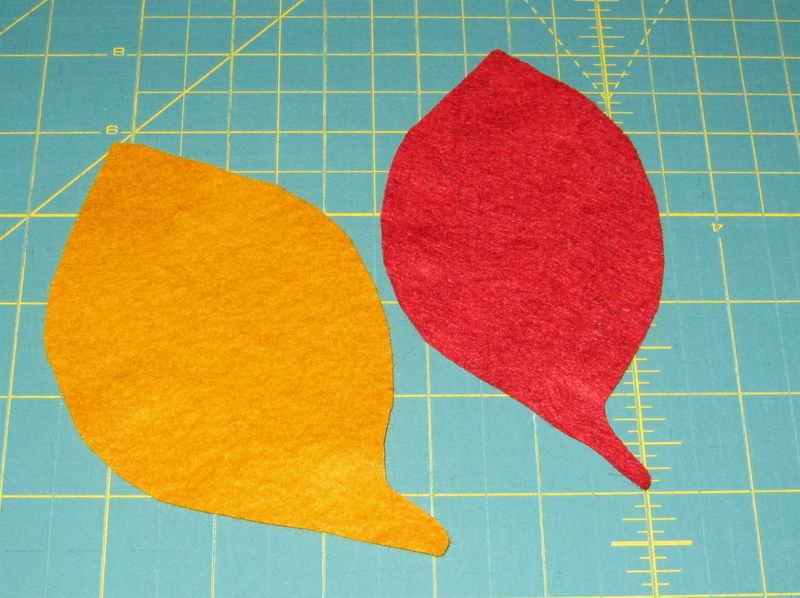 For each leaf, cut out two sizes; the larger one should be about 1/4 inch bigger all around than the smaller one. I played with color here; some leaves are high contrast like shown here, while others are two shades of the same color. 4. Stitch the two pieces together emphasizing what you want to in the leaf – for example, stitching around the edges to highlight the overall shape or stitching the vein pattern. I changed it up based on the individual leaves. You also have many options here for stitching – hand stitching using a variety of embroidery stitches or just a running stitch; machine stitching that takes advantage of your machine’s capabilities or a simple straight stitch. The bottom line is to make it fun and spend as much time as you want to or have. Use … enjoy … rearrange often! P.S. If you have a little person that wants to participate in the fun, they could glue the leaves together and then “make stitches” with a Sharpie. 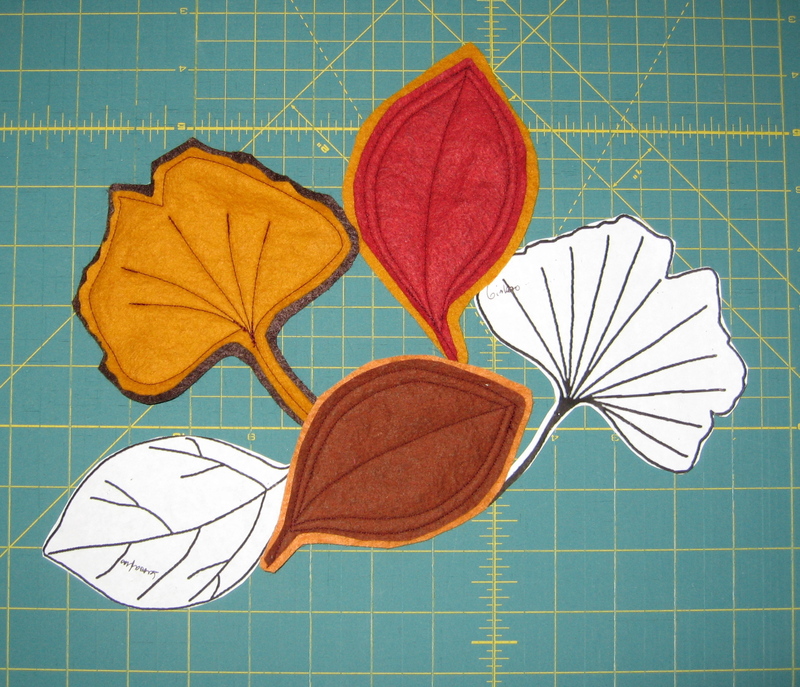 Or, if old enough, he/she could use a big needle and big stitches to hand sew the leaves together. This past summer a good friend of mine, Hilary Denk, asked if I would contribute a quilt to SCARCE, School & Community Assistance for Recycling and Composting Education, to auction at the organization’s first Green Tie Gala on October 24, 2012. This amazing organization was started in 1990 by Kay McKeen and since its early days has worked with many schools and communities to promote recycling and other environmental causes through educational outreach programs, speaking engagements, recycling events, grant writing support, etc. In fact, if you live in the Chicago area, you have likely benefited from one of its many programs. For example, SCARCE was instrumental to the process when my kids’ school was looking to fund, source, and install solar panels – Scarce’s vast knowledge made this undertaking way more manageable. With SCARCE’s mission in mind, I designed a modern quilt that is comprised primarily of repurposed clothing and fabric scraps that typically would be deemed too small to be of any use (and thus end up in the garbage), including a blue shirt formerly worn by my husband, leftover bits of shirts from others, as well as really small pieces of Liberty of London cotton lawn and vintage William Morris reproduction fabrics. 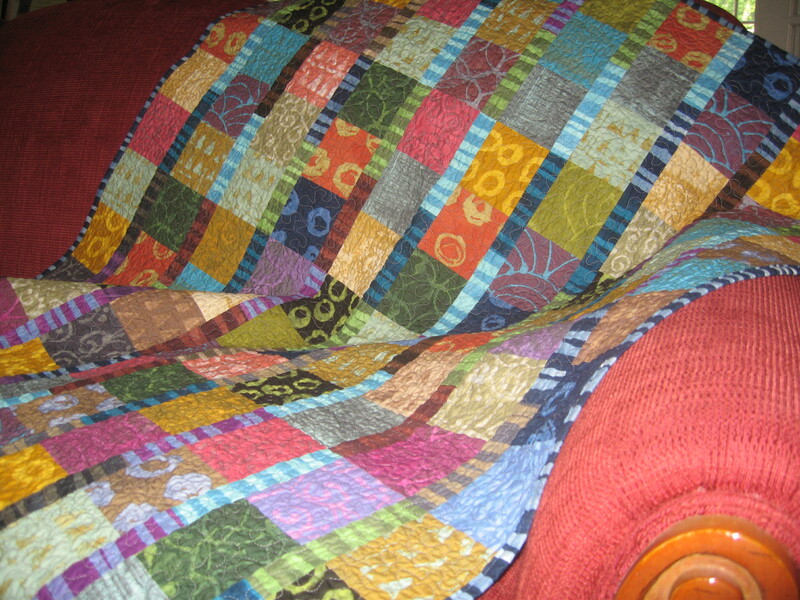 The quilt, named “Patina,” is now boxed and ready to go on its own mission: to raise funds for future SCARCE programs. You can learn more about SCARCE here and purchase tickets for the Green Tie Gala on October 24th at the Westin Hotel in Lombard here. My sunglasses case has been in tatters for some time, so with a new pair of sunglasses, I decided it was time to be out with the old and in with the new. 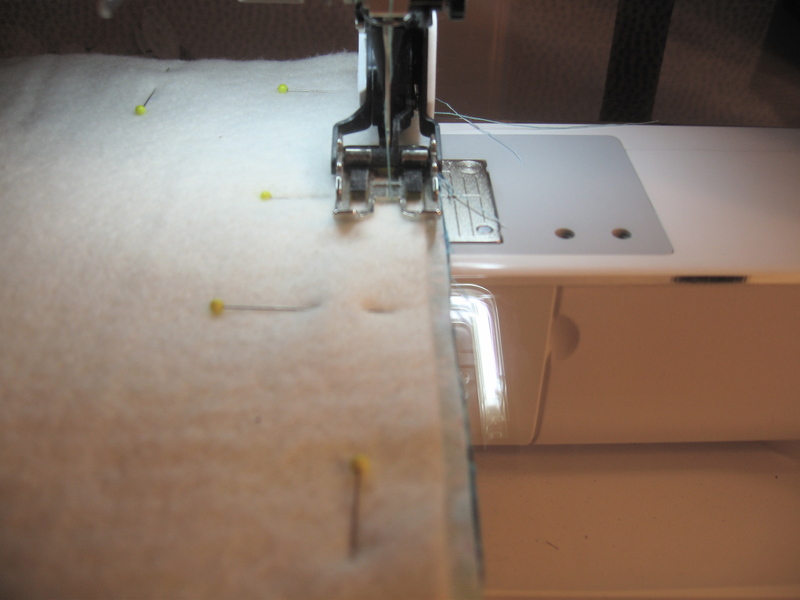 This simple case makes use of those small left over fabric pieces from other projects, or if you have just little bits, is small enough that you can piece the dimension you need. 1. 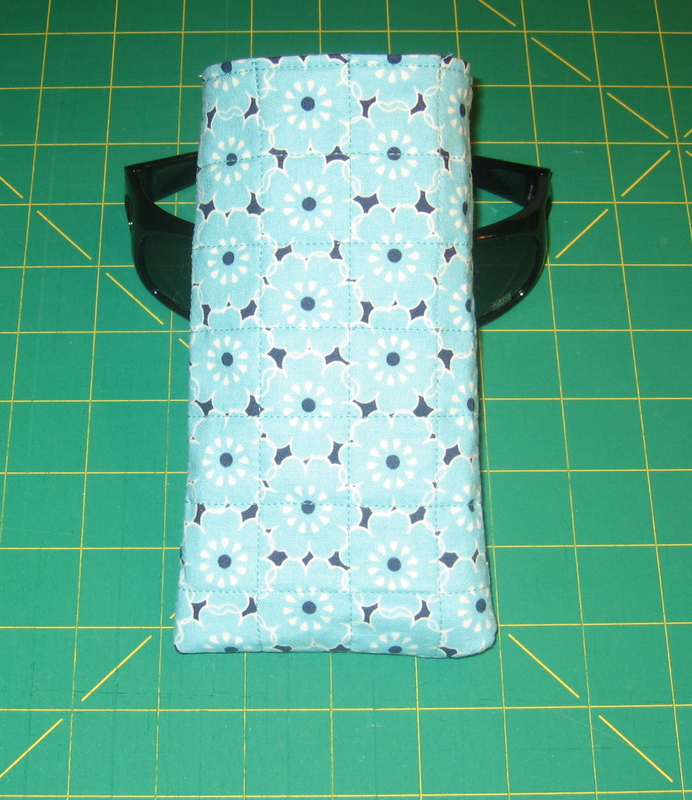 If you have a fabric sunglasses case that works for you now, just measure it, adding 1/2″ for each seam allowance. My new sunglasses are curved so they needed a bigger case. 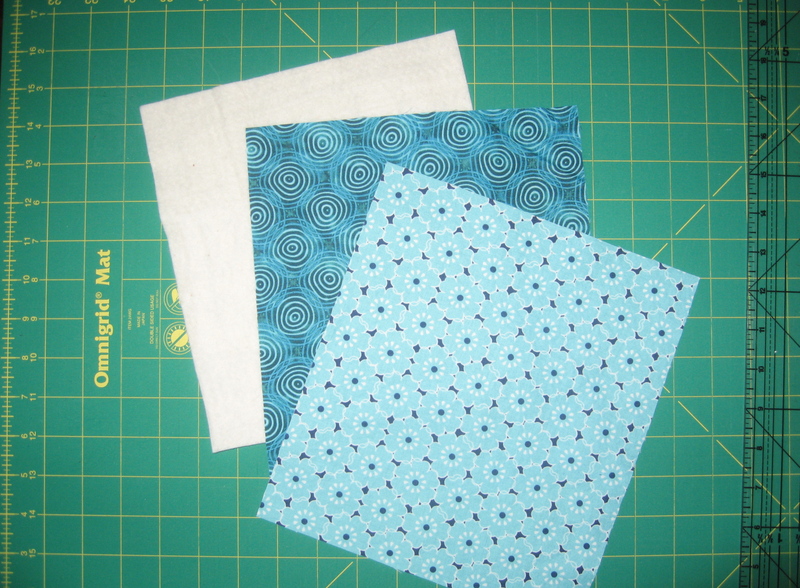 I cut two pieces of fabric – one for the lining and one for the outside – measuring 9-1/2″ x 8-3/4″. 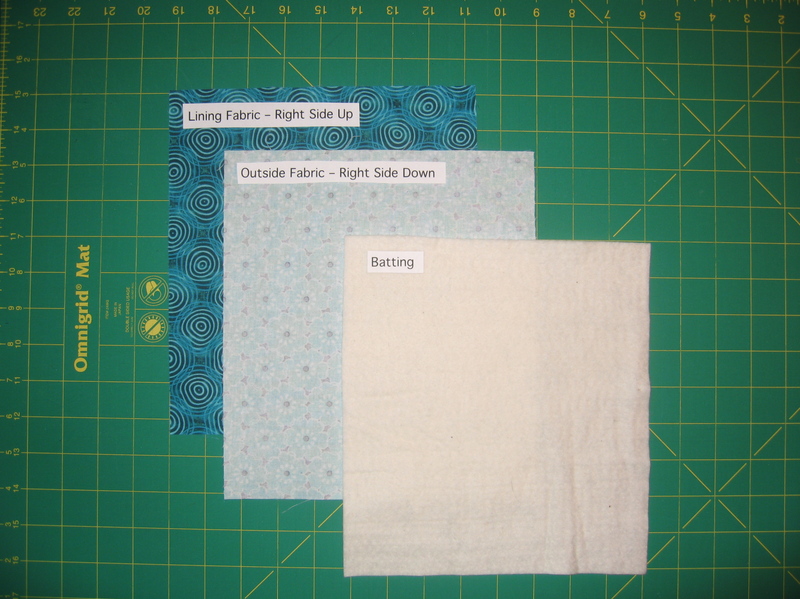 Cut the batting slightly smaller – I cut a piece measuring 8-3/4″ x 8-1/4″. 2. Make the quilt sandwich in the sequence indicated in the picture below. 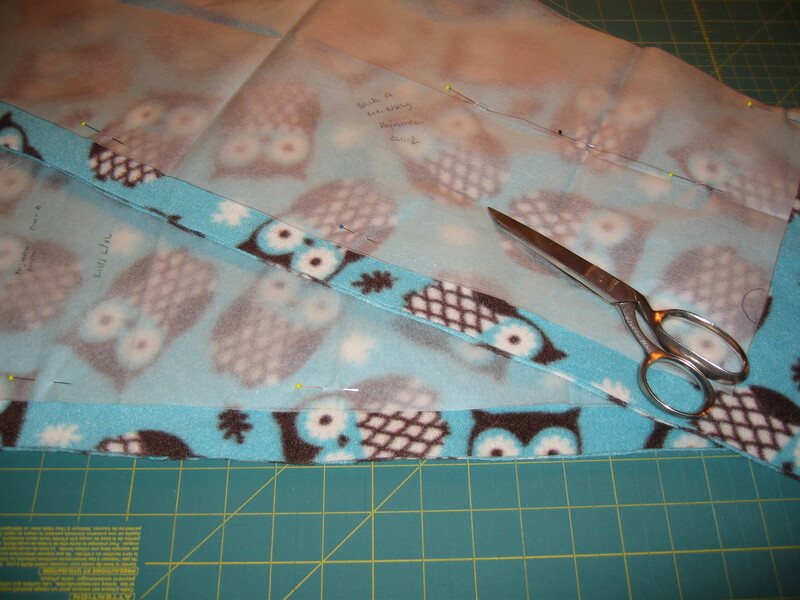 First lay the lining fabric down, then stack the outside fabric right on top, then center the batting on top of that. 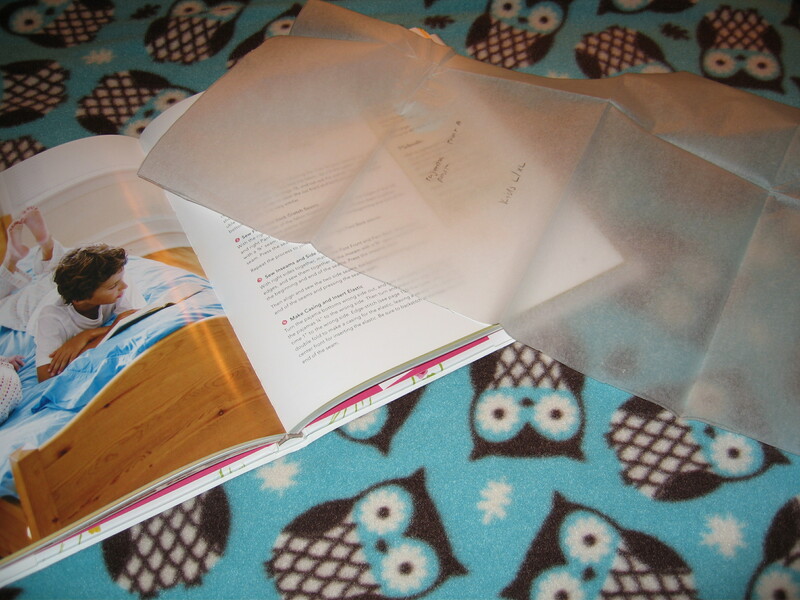 Smooth it all out so there are no annoying wrinkles anywhere and pin the layers all together. 5. 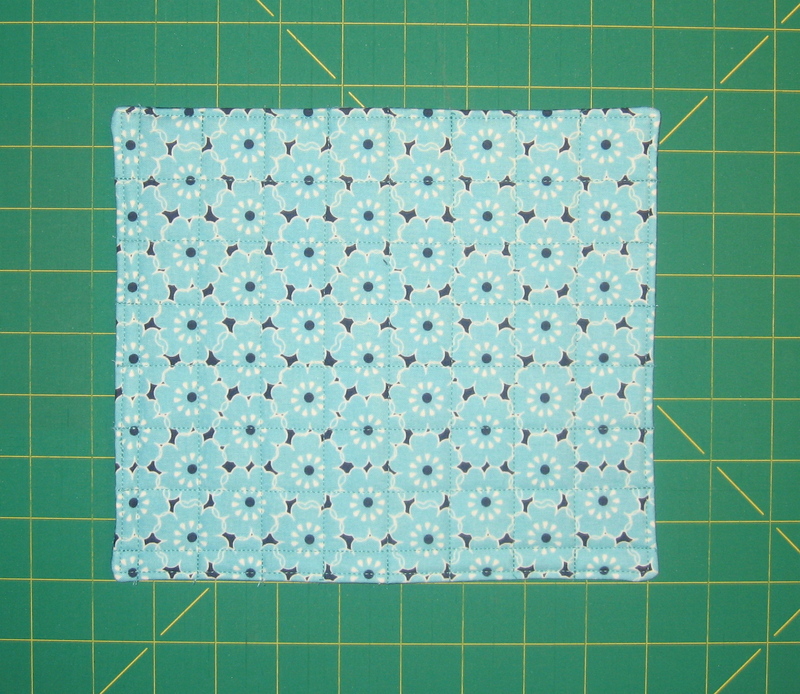 Fold the quilted piece in half lengthwise and stitch the bottom and side seam using a 1/4″ seam allowance. Turn and press. P.S. 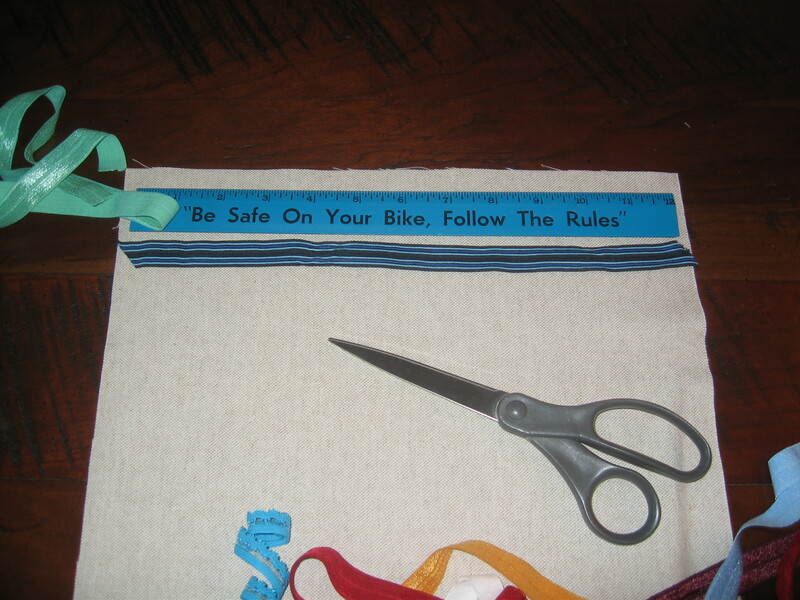 This is a great kids sewing project – for themselves, a teacher or friend. 1. Gather the supplies: 5/8″ FOE, scissors, 12″ ruler. FOE is available at most fabric shops; we purchased it at The Needle Shop in Chicago. 2. Cut a 10 to 12 inch length, angling the ends. This will allow you to loop the tie over your hair two to three times. My daughter has been wearing her ties a lot and we have not had a problem with fraying. If your’s don’t cooperate, try a bit of Fray Check on the ends. 3. 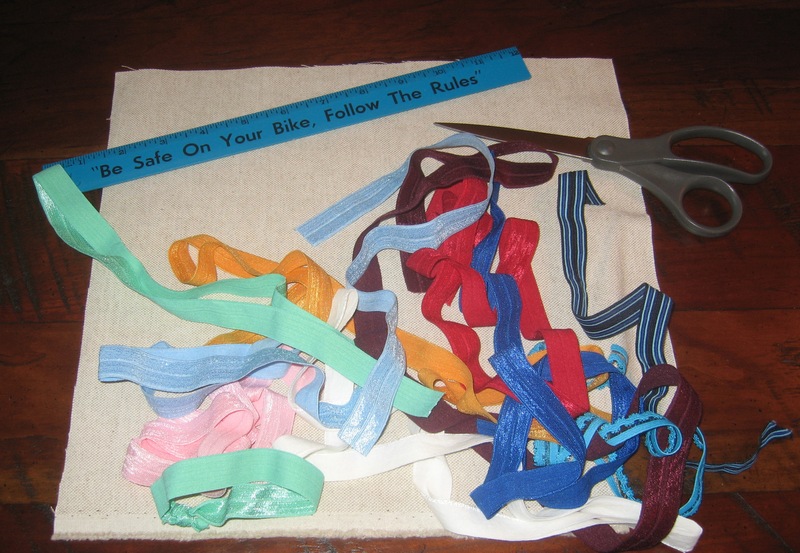 Tie a knot and, if necessary, trim the ends a bit to shorten. 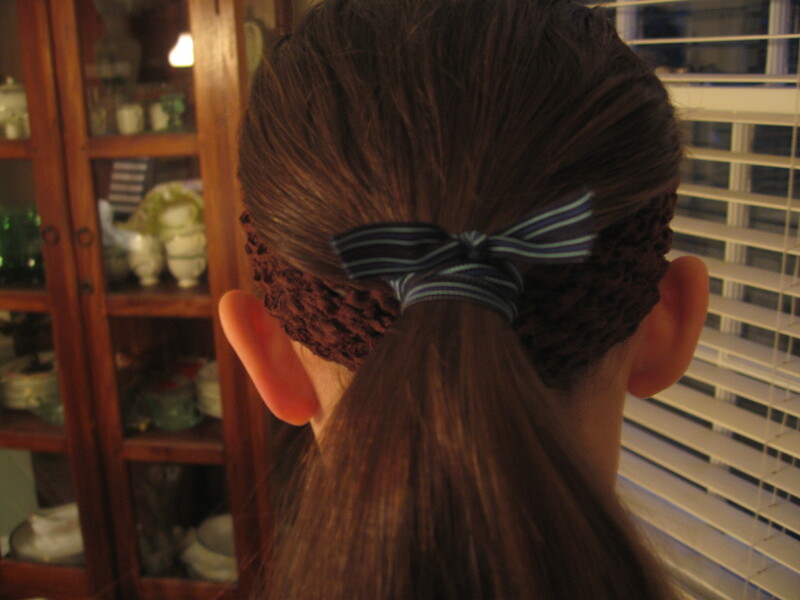 Some girls are making FOE headbands – just experiment with the length to cut or measure the circumference of an existing favorite stretchy headband and add a couple of inches to tie it off. 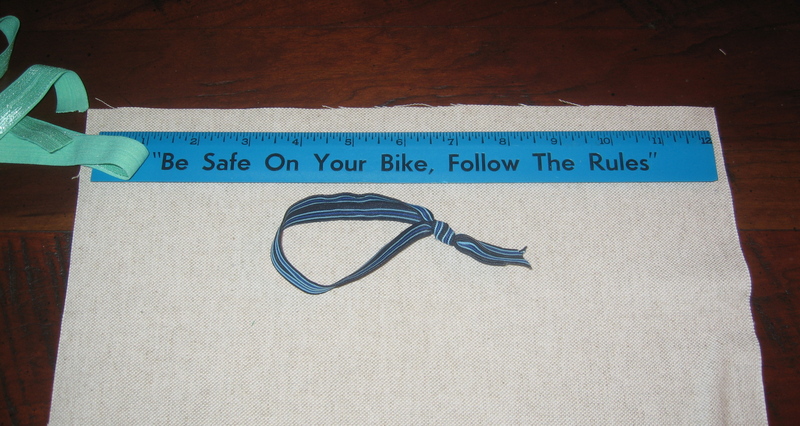 And, Sew Can Do has instructions for making shoelaces … who knew! 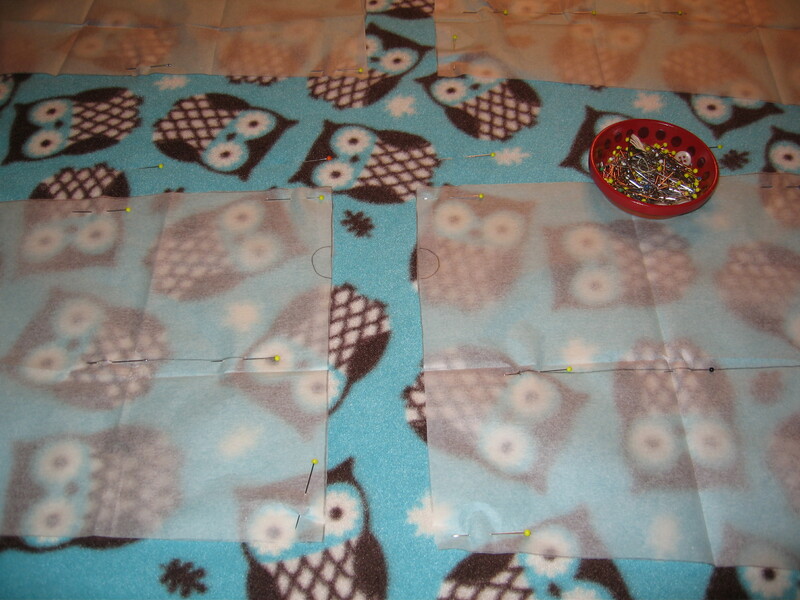 On a side note, I’ve used FOE for pajama waistbands and it is a bit trickier to work with than I would have thought. One of the best tutorials on the topic is here at Angry Chicken. Several weeks ago, I was asked by Troy Fabrics to design a quilt using Marcia Derse’s wonderful fabrics, including her latest collection, Nouveau Chic. If you’ve been following this blog since the beginning, you know I am a big Marcia Derse fan; in fact, one of my first posts featured her fabrics. 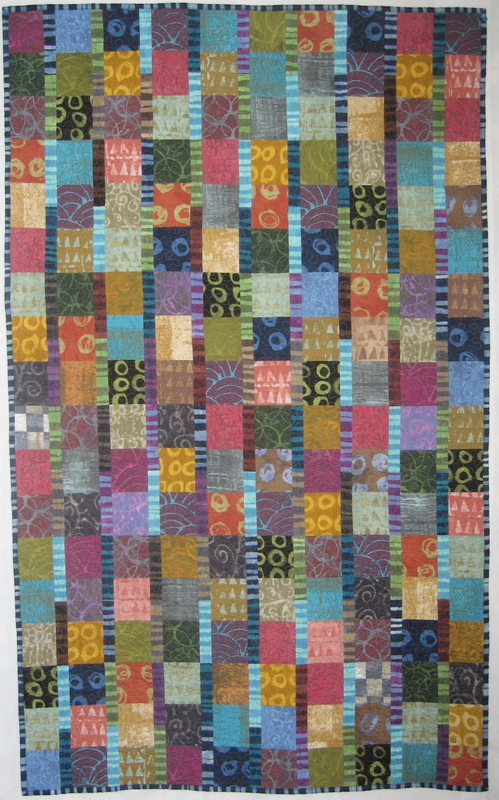 The quilt will be displayed at the International Quilt Market in Kansas City on May 18th – May 20th. For those of you going, visit Troy’s booth located in spaces 1800 – 1813. A free download of the pattern will be available on Troy’s website along with photos of Marcia’s fabrics. You can also see Marcia’s talent on display on her website. Take a look here at Fashionista.com to see highlights from the Pratt Institute’s senior fashion show – scroll to the bottom of the screen and hit the “Launch Slideshow” button. Kelsy’s work is featured on slides 18 and 19 but there is plenty of inspiration on the other pages as well! While some designs are clearly meant for twenty somethings (or younger), there are a few here that I would love to try on!